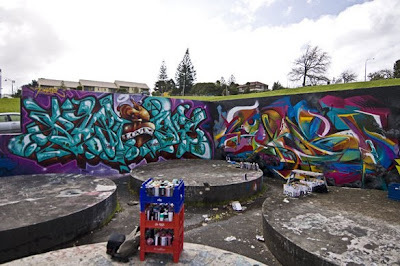 Corban Estate Arts Centre (CEAC) has been working with Waitakere City Council and Graffiti Art Crew TMD (The Most Dedicated) and have formally agreed that a wall at Corban Estate will be adopted by TMD for their high end artwork. The project titled SubUrban Development links to their project Urban Development at Rhubarb Lane in the central city. TMD certainly lived up to their name as they painted their way through last weekend's storm. A spokesperson for the graf art crew, Askew says, "TMD took it to mothernature this past weekend and managed to pull off a pretty impressive wall if I don't say so myself. 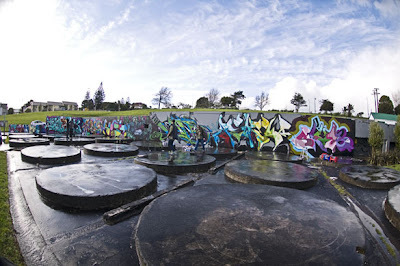 Fighting wind, cold and driving rain and armed with paint, towels and a never die attitude the guys got in there and smashed it like the champions they are..."
TMD is a group of urban artists at the top of their game in NZ, with an international reputation and linked to a worldwide network of graf artists. 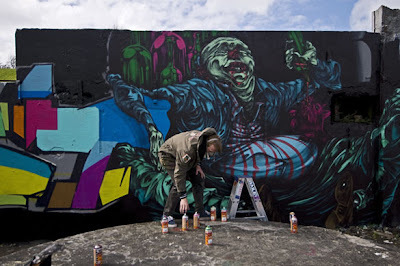 Other graf artists wanting to be involved need to contact CEAC in the first instance.